Donald Weber is a former architect turned visual media artist. His latest project, War Sand, is a series of microscopic photographs that depict pieces of shrapnel embedded in individual grains of sand along the beaches of Normandy. Each photograph—which takes over eight hours for Weber to produce—is a testimony to one of the most famous days in history, as well as to the relationship between art and science. "I like the idea that through science, art can reveal itself," Weber told Texas arts blog Glasstire. "And through art, science can reveal itself." In War Sand, both elements are certainly present. Physicist Kevin Robbie helped produce the photographs by using a powerful magnet to withdraw the shrapnel bits from the sand samples. 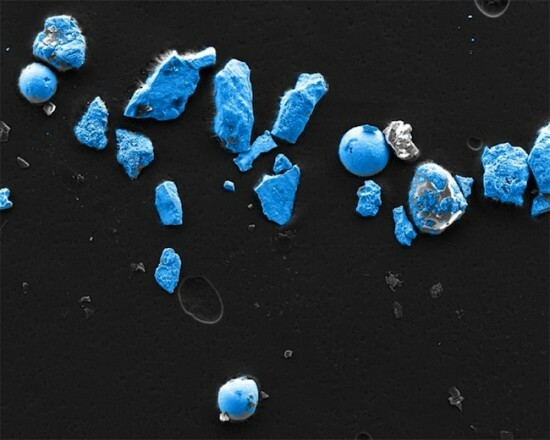 The extracted metals were placed underneath a microscope, where Weber’s original theory—that shrapnel remained on Normandy’s beaches—was proven true. The sand grains that “housed” the shrapnel were then color coded to identify the types of metals embedded in the beach seventy years ago. The selected color palette—blue, green, and yellow—matches the natural colors found on the beach. One photograph depicts what looks like an artillery shell but is actually a diatom, or the casing built by ocean algae. Since diatoms feed off iron, Robbie posits that the iron this particular diatom fed from was in fact a shrapnel remnant from D-Day. “Ultimately,” Robbie said to Glasstire, “this remnant from this battle that killed many people is providing nutrients to a form of life decades and decades later.” The project as a whole demonstrates an amazing symbiosis between technology and art, but also of nature’s ability to rebuild itself after the intrusion of mankind. As Weber noted, "History never goes away. There's always a trace here or a remnant there.” At the project’s completion, Weber hopes to compile all the photographs into a book. 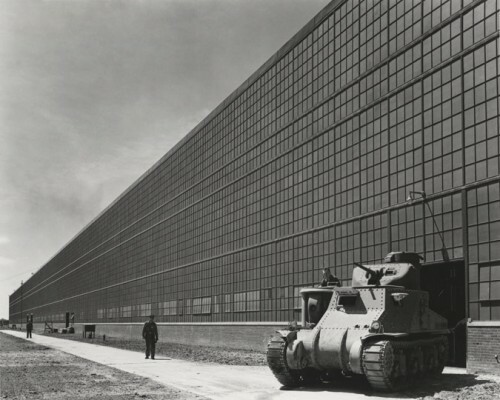 Architecture in Uniform: Designing and Building for the Second World War Canadian Centre for Architecture 1920, rue Baile Montréal, Québec, Canada Through September 18 How did World War II impact the built environment? This new exhibit curated by Jean-Louis Cohen explores how 20th century architects contributed to the war efforts and how their work ultimately led to the modern structural and technological innovations that make some of today’s complex designs possible. WWII was an accelerator of technological innovation, and from 1937 to 1945 architects were frequently pressed to pursue the most modern solutions, which often meant the most cutting edge. Designed by New York-based WORKac, the exhibit is comprised of drawings, photographs, posters, books, publications, models, historical documents, and films that reveal how contemporary architecture left its mark on the landscapes of both the Axis and the Allied powers. Organized thematically, the exhibition focuses on wartime activity as well as architects and their projects in Canada, France, Germany, Italy, Japan, the Netherlands, Spain, the United States, and the USSR. Architecture in Uniform is part of a larger project at the CCA that examines the various roles of architecture from the Second World War to today called On the Natural History of Destruction.